Photo courtesy Courvoisier. Rosé wine* is a summer favorite, lighter in alcohol and lighter on the palate than red wines. Last year, in the spirit of summer, Courvoisier, one of the world’s leading Cognac houses, launched Courvoisier Rosé. With the color of a rosé wine, Courvoisier Rosé is a blend of Cognac—made from distilled grapes—and red wine grapes, pressed as they are for wine. The color and flavor of Courvoisier Rosé are equally exquisite: a rosy-hued spirit with notes of blackberry, black currant, cherry, honey, peach and vanilla. It gives the impression of a fine liqueur rather than Cognac (liqueurs are distilled alcohol flavored with cream, flowers, fruit, herbs, nuts and spices, with added sugar). Traditional Cognac is 40% alcohol alcohol by volume (80 proof), while Courvoisier Rose is only 18% (36 proof); the full flavor belies the lower alcohol. Easy drinking Courvoisier Rosé is an innovation in the Cognac category, and can be enjoyed on every occasion, year-round. Try it with dessert! A 750ml bottle has a suggested retail price of $24.99. Different and delicious in a handsome bottle, it’s a great gift item. *The juice of both red and white wine grapes is white (or light) in color. The color of red wine comes from extensive contact the juice has with the pressed wine skins. Rosé wines, also called blush wines, are made from red wine grapes that are only allowed minimal skin contact—just enough to achieve the rosy color. The skins are then discarded, rather than left in contact throughout fermentation, as they are with red wine production. 1. 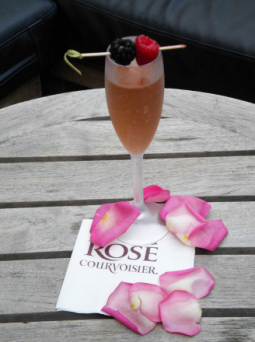 Shake Courvoisier Rosé and liqueur together; strain into a chilled Champagne flute. 2. Top with Champagne. Add 3 blueberries or 1-2 raspberries to the flute or on a cocktail pick, or perch a notched strawberry on the rim. The handsome bottle begs to be given a gift. Photo courtesy Courvoisier.